Branson is known for its world-class live shows, the stunning natural scenery around the Ozark mountains, beautiful lakes, and the award-winning theme park – Silver Dollar City, but the exciting attractions in Branson have expanded and now includes a growing list of diverse museums such as Titanic Museum, Wax Museum, Ripley’s Believe It Or Not Museum, Celebrity Car Museum, and Dinosaur Museum. The Dinosaur Museum is one of the most popular museums in Branson that gives the whole family and friends a chance to see the replicas of the biggest creatures ever lived on earth. The dinosaur exhibits in the museum range from the foot-high Microraptor to the T-Rex which stands at over two-stories high and feature cutting-edge animatronics. 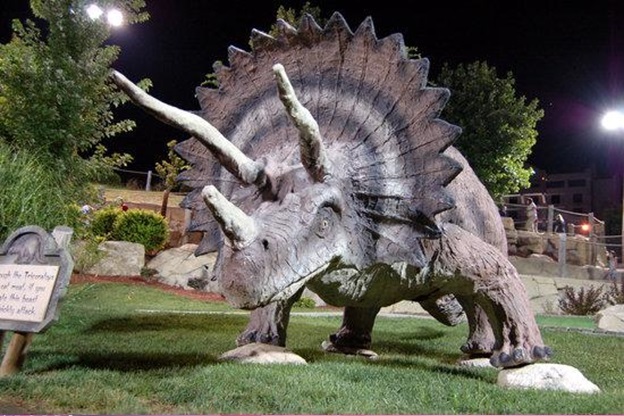 Located at West 76 Country Boulevard in Branson, the Dinosaur Museum features an enormous display of exhibits of over 50 life-size dinosaurs and other prehistoric creatures, activity centers, and an in-house movie theater where you can watch educational films about the creatures. In the museum, you will see man-made life-size sculptures of dinosaurs, many are more than just fossils, bringing a sense of reality and authenticity about the displays. Since the opening of Dinosaur Museum in Branson in 2009, visitors have been flocking to the place to see amazing recreations of pre-historic creatures. Upon entering the facility, you will feel like you have been transported back in time as you get close to the long-toothed monsters. These monstrous replicas of pre-historic creatures were the works of the best artists and sculptors in the world who toiled to bring the gigantic creatures to life. You’ll be fascinated with great astonishment as you come face to face with the most savage predators of their time. On a self-guided tour around the Dinosaur Museum in Branson, you’ll discover everything from the ferocious looking Tyrannosaurus Rex to the relatively tiny, one-foot-tall microraptor. Each of the display of dinosaur in the museum features a descriptive details to help everyone who has questions about the creatures, giving everyone educational and entertaining adventure. The fascinating replica displays of gigantic creatures were carefully created by trained paleoartists who skillfully fashioned molds from original dinosaur skeletons, making realistic recreation of each creature to look like authentic dinosaur. After a whole day of fun touring the Dinosaur Museum in Branson, you can enjoy more fun if you visit the most famous theme park in Branson, Silver Dollar City. From mid March to end of December, Silver Dollar City offers lots of entertaining attractions and many exciting activities. The park features dozens of amusements and 30 thrilling rides that include Frisco Silver Dollar Line Steam Train, Giant Swing, world class roller coasts, PowderKeg, water-shoot-out rides, and steam engine train rides. The park also offers live entertainment shows performed by some top Branson artists. The Dinosaur Museum is one of the most visited tourist spots in Branson where you can have the chance to see the replicas of gigantic pre-historic creatures that have ever lived on earth.